Simone Caprodossi, an Italian underwater and travel photographer, has spent a good 15 years taking UW photos of marine life and shooting topside snapshots of his various international travels: from South Africa to Micronesia, Sipadan, Fiji, Bali and Maldives. In 2007, his corporate job took him to Dubai where he still resides today. His passion for scuba diving led to him dedicating most of his free time “submerging ” in the waters of the Arabian Gulf pursing his interest in underwater photography at various dive destinations in the region. He admires the peace and beauty of underwater life! For the past three years, he has been one of the main contributing photographers for the Emirates Diving Association (EDA) magazine. Caprodossi’s latest work is featured in the EDA Magazine March 2015 issue with the front cover photo of a shark having been taken by him. He has written an article about his Aliwal Shoal (South Africa) underwater diving experience capturing sharks. Several Caprodossi’s awe-dropping close-up photos are in the magazine. Nico de Corato, owner of DubaiBlog and AbuDhabiBlog, also enjoys scuba diving and UW photography. A member of the EDA and heli rescue diver with Bergamo Scuba Angels, he has started his cooperation with the magazine of the association DIVERS for the Environment. Nico is also featured in the EDA Magazine as a contributing writer for the March issue where he visited a scuba diving factory (while in Italy) to learn firsthand about SEAC’s modern equipment in testing regulators. Nico and Simone have more in common than simply being both Italians living in Dubai; both enjoy scuba diving and underwater photography. Nico has experience shooting underwater videos with Nikon D3200 and NiMAR; whereas, Simone uses a Canon system underwater in a Subal housing with Inon lights for his photos. Simone likes to use his photography to support environmental initiatives and is involved in shark and turtle conservation projects locally. Nico is an enthusiast underwater photographer and had the opportunity to increase his knowledge during a diving session at the Banco di Santa Croce, a possible diving destination for all scuba diving enthusiasts in the Emirates. He took the opportunity to shoot some pictures for the magazine of the Emirates Diving Association. Both have a passion for diving to admire underwater marine life. Nico got to know Simone through the Emirates Diving Association, both being members of that association and contributors of the magazine it published, ‘Divers for the Environment.’ The idea of an interview was soon born. Nico: What is the most beautiful photograph you shot underwater and on the mainland? Simone: My most successful underwater photo is definitely the split level snapped in Dubai during the release of sea turtles for the Dubai Turtle rehabilitation project. Thanks to the perfect conditions of the sea and a sea turtle that was slower than the others I was able to snap a nearly perfect split level with the Burj al Arab. On the mainland – apart from nature – I like to photograph people, moments and details. It is hard to pick one, but staying in the area one of my favorite pictures is an image taken in Oman with an Omani perfectly framed in a traditional wooden door. Nico: What are your favorite subjects to photograph? Simone: I do not think I have a favorite subject. I like to find a photo opportunity in every situation. In general, I like to try to capture moments and atmospheres. I do not like and I do not have much patience or techniques for studio photography or portraits. For this, I love nature and underwater photography, where nothing can be predicted and there are always surprises. 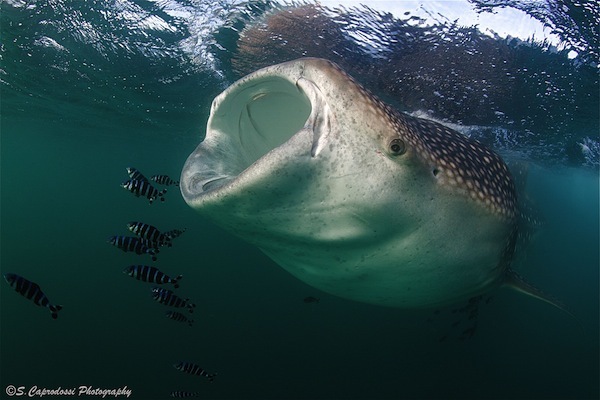 Having said that, I have a passion for sharks since I was a child and I was lucky enough to participate in research projects on whale sharks and to dive in many destinations ideal to meet sharks in Palau, South Africa, Sudan, Mexico, and elsewhere. Nico: The photo you would like to shoot. Simone: I am planning for the Sardine Run in South Africa in June, and I have been dreaming for years to find the great baitball of sardines with sharks, dolphins and the great whale. Let us see if I will be lucky. Nico: Tell me your best trip experience without a camera (not for work, I mean). Simone: Almost 10 years ago, I have been to the Galapagos and I had a small compact camera in a small housing without flash, which filled up with water after a day; thus I was left with no photos but fantastic memories. I might go back next February armed with camera equipment in abundance. Another memorial experience was a non-underwater trip in Mali that, unfortunately, now would be very dangerous. I came back with hundreds of slides that I continue to promise myself to scan. Nico: How do you plan a dive or a series of dives aimed at photographing a particular subject? Simone: In the beginning, it’s important to understand what kind of conditions you will have and what type of behavior the animals tend to have, for example if it’s easy to get close and how to best approach them; this has to be taken in consideration not to frighten subject matter before taking a photo. If the place or the subjects have already been widely photographed, I also like to study what other photographers’ took to give me some idea of some shots that I want to capture for myself. Beyond the preparation, underwater photography is unpredictable, both for individuals and for the lighting and visibility conditions; so, the best planning is to try to have more opportunities as possible to return to the same place to meet the same subject(s). Knowing you have more chances, the first dives are more relaxed without the pressure of having an only chance for the photo. This allows you to review the results and look for the ideal image in subsequent dives and gives more chances to be lucky and observe some unique marine life behavior. Nico: What is your advice to those who would like to become underwater photographers? Simone: To those who want to take underwater photography, I advise to first acquire a great diving experience. Divers have to be in control and relaxed at all time when underwater before adding the distraction of photography. It can also be a good idea to start with a waterproof quality compact camera: there are many today that allow manual setting / raw format and have excellent macro outfitted with an acceptable wide angle, using an underwater flash. An easier and less expensive way to start. If becoming passionate about it, it’s possible to shift to a complete SLR equipment. Nico: Why did you choose to live in Dubai? Simone: Dubai happened by chance as a job opportunity, the company I work for has offered me a position here about 8 years ago. It was supposed to be for two years and then it led to being an expat and deciding to transfer here from Europe. It marked a turning point to dedicate myself to underwater photography and having the opportunity to practice diving in so many beautiful places and with easy access, in a couple of hours, to Asia and the Indian Ocean. Nico: What is the most beautiful place to dive between UAE and around the region? Simone: My favorite places are Musandam and Islands Damanyiats. The visibility is not always ideal, but when a good visibility day happens, diving in Octopus Rock, Musandam or Aquarium, Damnyiats are wonderful. In conclusion, Nico thanked Simone for his availability. As a diver and enthusiast for underwater photography, Nico hopes he too will be able to follow in one of his expeditions and bring home some good snapshots with his advice. To view some of Simone Caprodossi work, visit http://www.scaprodossiphoto.com/. His photography online portfolio showcases his talent in taking pictures of underwater adventures and stunning images while travelling in various countries.